One of our Packaging employees recently made a beautiful wooden tissue box from scratch! We share more about Blake’s time with us and his various hobbies and passions. Blake is an awesome and friendly guy. He brightens any room he’s in with his big smile and positive attitude. It’s no surprise that he’s got plenty of friends and fits right in with the team at Packaging & Warehousing Bibra Lake. Blake first joined us in late 2009 and is always ready to complete the task at hand. He never makes a fuss and is keen to learn new skills and try his hand at new jobs too. As a valuable member of the production team he’s worked on numerous contracts over the years. These include making flags, folding and packing bags, and sorting batteries and other products. Blake likes to keep busy with a number of hobbies, including photography and line dancing. He enjoys going out shopping and being independent. 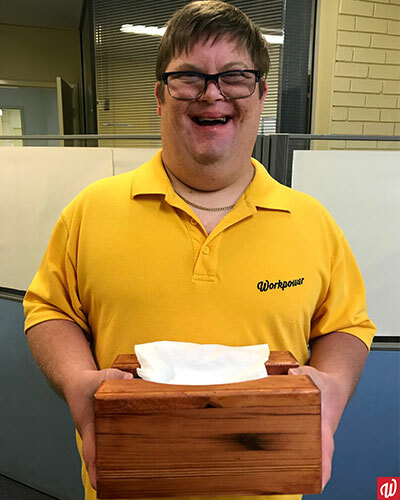 In addition to these interests, he’s got a passion for woodworking, and recently completed this tissue box cover. Blake put a lot of effort into this gift, which is made from individual wooden pieces and with a curved edge. It even has a decorative pattern inside! He finished off the piece with a wood stain to bring out the colour too. Great job Blake, it looks wonderful! He loves the challenge and enjoys getting all the details just right. This is just one of the many items he’s made, and we’re sure he’ll continue to hone his woodworking skills in the future. We hope you keep up the great work! 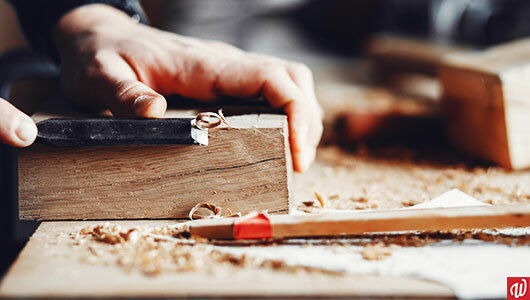 Workpower provides opportunities for people with disability across a number of social enterprises. Want to see how we can help you? Get in touch with us today at 1800 610 665 or email us here.